The International Space Station is seen in this still from a camera on the space shuttle Atlantis after the two spacecraft undocked on May 23, 2010 during the final planned flight of Atlantis for NASA's STS-132 mission. Ten years ago today, humans arrived at the InternationalSpace Station ? and the orbiting laboratory has not been empty since. While crew members come and go, NASA and its internationalpartners have been occupying the laboratory in the sky uninterrupted for adecade. The space station itself spent two years without a permanent crewbefore the first astronaut and cosmonauts arrived on Nov. 2, 2000. "I think it's kind of incredible," said astronautPeggy Whitson, chief of NASA's astronaut office at Houston's Johnson SpaceCenter. "It's miraculous to have had people on orbit for 10 yearscontinuously." About15 countries and space agencies from the United States, Russia, Europe, Canadaand Japan have been building the $100billion space station since 1998. Under NASA's new space plan, the stationis expected to continue operating through 2020. Thespace station, now about as long as an American football field ? and includingabout the same internal living space as a Boeing 747 jumbo jet ? is practicallycomplete. Despite the enduring nature of the space station, there havebeen some setbacks ? most notably from the devastating tragedy of the Columbiashuttle accident in 2003 ? and the subsequent 2 1/2-year grounding of the spaceshuttle fleet until flights resumed. ? At the time, the space station's crew size was cut fromthree people to just two occupants ? one American and the other Russian. Evenduring those lean times, the only time the station was left unoccupied was whencrew members performed spacewalks outside the confines of the structure. "We've overcome so much, and to know that we've keptthe station permanently occupied that whole time, to me makes us a spacefaringcivilization," NASA's deputy administrator Lori Garver told SPACE.com. "I have also said I do not feel I will have been a success at this job ifthere are days ahead where we do not have people living and working in space.So 10 years is a good start ? we need to keep it running." The Columbia disaster slowed down the pace of space stationconstruction because the shuttles were the only vehicles capable of carrying upsome of the outpost's larger components. The shuttle fleet returned to flightstatus in 2005, with station construction resuming in 2006. "Visually it's just stunning," said astronaut TomJones, who visited the first station's crew - called Expedition 1 ? during theSTS-98 shuttle flight in 2001. "If I look at my snapshots from 10 yearsago on STS-98 ? and then you look at what's up there today ? it's justincredible growth in that facility." As of Nov. 2, the space station will have completed 57,361total orbits around the Earth with humans onboard, said NASA space stationflight director Royce Renfrew. The lab circles about 220 miles (354 km) above theEarth's surface. The first expedition of astronauts to live at the InternationalSpace Station arrived Nov. 2, 2000 aboard a Russian Soyuz capsule that hadlaunched Oct. 31, 2000 from Kazakhstan's Baikonur Cosmodrome. Three spaceflyers were aboard: American commander WilliamShepherd of NASA and flight engineers Sergei Krikalev and Yuri Gidzenko ofRussia's Federal Space Agency. They stayed onboard for a total 136 days, or alittle more than four months. Astronauts who have come since, such as Nicole Stott, whoserved on Expeditions 20 and 21 in 2009, expressed their gratitude to thepioneers who began the station program. "It just was such a great starting point for all of us,who now get to experience this ginormous volume and still sharing in thisspectacular international program that has made it such an internationalsuccess," said Stott, who is returning to the station this week aboardDiscovery. Over the years since that first mission, space stationliving has changed quite a bit. While early crews had a rather Spartanexistence, spending almost all of their time keeping a fledgling stationrunning, current crews can devote much more time to research, and takeadvantage of wider food and entertainment options and even choose among avariety of exercise equipment (such as the relatively new COLBERTtreadmill) to stay in shape. "One thing that I noticed over that time is both thequality of life in training and the quality of life onboard the space stationhas continued to improve," said NASA astronaut Tim Kopra, who served foralmost 60 days as a flight engineer for Expeditions 19 and 20 in 2009. "Andthat's a great thing. I think we're learning how to live in space. And everystep and every crew is doing it better and getting smarter and the program isgetting smarter." Now that the space station is largely complete, crews livingthere can focus much more of their daily efforts on science research, ratherthan building the station's complex network of modules and tunnels. In 2005, Congress designated the station a U.S. NationalLaboratory, opening the outpost's U.S. science facilities up for use by non-NASA researchers.More than 400 scientific experiments in fields such as biology, human physiology, physical andmaterials science, and Earth and space science have beenconducted there over the last decade. Yet there is still a long way to go toward taking fulladvantage of the station for science, some say. "What we haven?t done with the space station I think,and which is a huge opportunity, is to use it as a test bed for goingbeyond," Jones said. "It should be the test bed for life supportsystems and communication gear and new generations of spacesuits and even tinyself-propelled spacecraft that will allow us to explore an asteroid ? thoseshould all be checked out, assembled and proven at the space station in thenext 10 years." There may be some growing pains ahead for the station whenNASA's space shuttles retire, likely next year, and take with them their hugecapacity for carrying large cargo to space. The ISS will have to rely on Soyuzspacecraft, as well as unmanned European, Japanese, and possibly commercialcargo ships. "It's going to be a little bumpy at first as we getused to not having that powerful cargo ship coming to the station, however,just like any other challenge we have faced at NASA we overcome it and we learna whole lot from it," said NASA astronaut Tracy Caldwell Dyson, whorecently returned from a six-month sojourn at the station as part of Expedition24. "So I think we have a lot of good things to look forward to." A new bill passed by Congress, and recently signed into lawby President Obama, authorizes NASA to continue the space station program throughat least 2020. "I see the space station as just beginning,"Whitson said. "I have hopes that we're not halfway through ? we're lessthan halfway through." 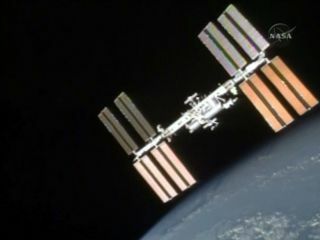 Poll: Do You Think The International Space Station is Worth $100 Billion?